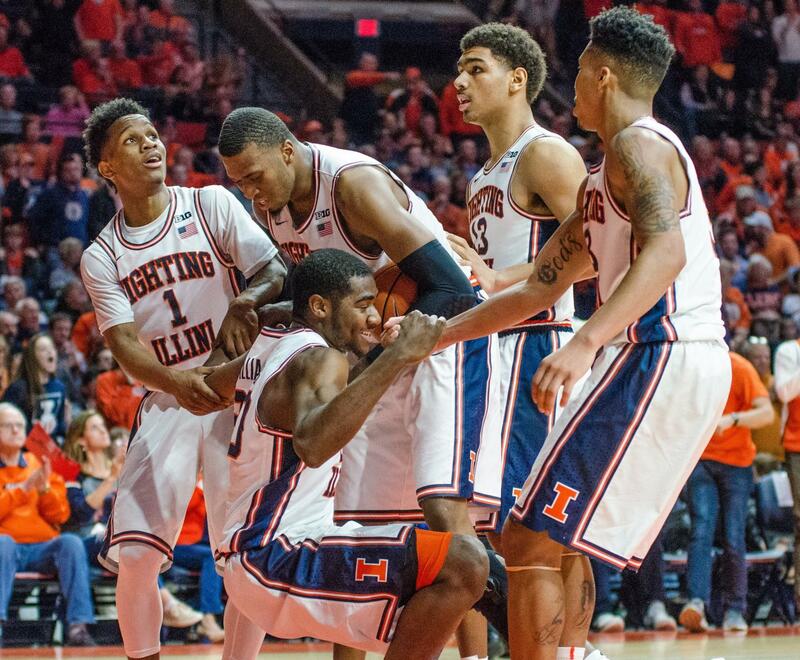 Trent Frazier, Leron Black and Te’Jon Lucas help up teammate Da’Monte Williams during Illinois’ 86-93 loss to No. 6 Purdue on Feb. 22. As the date changes from October to November, the Illinois men’s basketball team gets closer and closer to kicking off its 2018-19 campaign. With a large number of familiar faces from previous years replaced by young talent, the Illini are predicted by most to finish in the bottom half of the Big Ten. Few teams in the nation have experienced more roster turnover this summer than the Illini. Despite these changes, there are some things about the 2018 Illini that will still be similar when the season tips off against Illinois Wesleyan on November 2. Barring an injury, sophomore Trent Frazier will be the starting point guard for Illinois this year, looking to continue building off a Big Ten All-Freshman year. 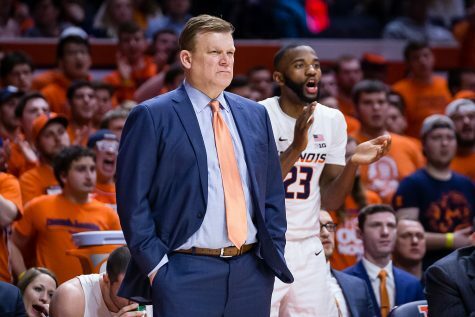 Frazier took over the helm of head coach Brad Underwood’s Illini 16 games into last season, and after that transition, he put together one of the best freshman seasons in Illinois history. Frazier averaged 14.1 points per game in the conference, the most out of any freshman, to go with almost four assists and two rebounds a game. Frazier also led the Big Ten in steals at 1.7 a game. 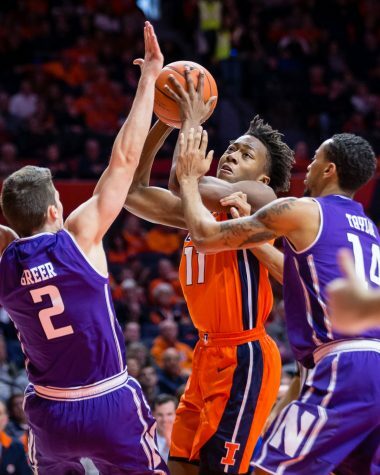 It’s likely Frazier will be the leader offensively for the Illini as he is their leading returning scorer, but this year, he should get more help on offense from other places. One of those helpful assets will be Kipper Nichols, who for the first time at Illinois got to train with the same coach for a full offseason. While Nichols was kept out of the starting lineup until the second half of last year, the proven Big Ten scorer put up some of the best scoring games for the Illini. Nichols averaged 10 points and 4.2 rebounds per game for Illinois last year, both good for third on the team. Standout performances included 27 points in 22 minutes against Michigan State and 31 points in 33 minutes in the team’s season-ending loss to Iowa. As the only returning front court player, Nichols will see a good amount of minutes at the power forward spot, where he will have to improve his rebounding and defense from last year. The two other returning players from 2017 are sophomore Da’Monte Williams and senior Aaron Jordan. Both will likely see a good amount of time early in the year with Underwood trying to find which combination of players works for the Illini. 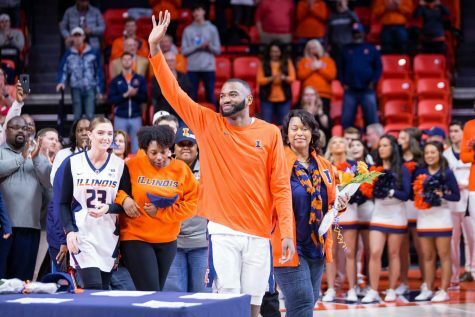 Williams is finally healthy after tearing his ACL in his senior year of high school, and Underwood said during one of their open practices that he’s the healthiest he’s ever been in Champaign. Jordan also had somewhat of a breakout season in 2017. After being buried on the bench for former head coach John Groce, Jordan made the most of his minutes for Underwood, and for a while, led the nation in three-point percentage, finishing at a scorching 46.3 percent. Both Williams and Jordan provide Underwood with relatively experienced depth, and unless they both take a step back on the court this year, they will probably be parts of the rotation, even seeing some spot starts. After those two, however, the Illini’s roster becomes a lot more unfamiliar. 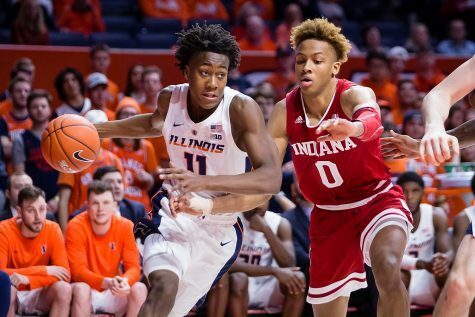 The eight newcomers for the Illini are led by freshman guard Ayo Dosunmu, who comes in as the highest-ranked recruit to play for Underwood. At six-foot-four, Dosunmu has prototypical guard length and has shown he’s capable defensively. 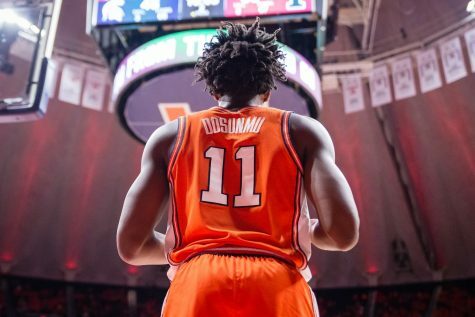 While he may not handle the ball with frequency due to sharing the back court with Frazier, Dosunmu will compete to be the Illini’s best perimeter playmaker and defender, and he’s shown good range in practice on his jumper. With Frazier and Nichols shouldering a lot of the scoring burden, Dosunmu should be free to impact the game in other ways. Last year, Underwood talked a lot about creating space for Frazier offensively, and that commitment showed in this offseason, as the Illini have upgraded their perimeter shooting from the depths of Mark Alstork, Mark Smith and Te’Jon Lucas. Tevian Jones may be the best scorer on the roster already, as a freshman. Jones was a lock to go to Arizona out of Culver City, California, before FBI accusations against Arizona head coach Sean Miller and his program turned Jones away. Dosunmu and Jones have shown a nice connection in practice, linking up for some highlight-reel alley-oops, something Illinois fans haven’t seen in a long time. Jones is the best athlete Illinois has had in the better part of a decade, and he has a basic but serviceable game off the bounce to go with a jumper that extends to three-point range. Another player who will space the floor for the Illini is Alan Griffin, a six-foot-five wing from New York. It may be hard to find minutes in the loaded back court, but Griffin is a competitor and one of the better shooters on the roster, to go with his good length. While the Illini won’t need to count on Griffin offensively, that doesn’t mean he can’t find a productive niche on the team. With all the perimeter talent the Illini have, however, the front court could be a struggle all year. 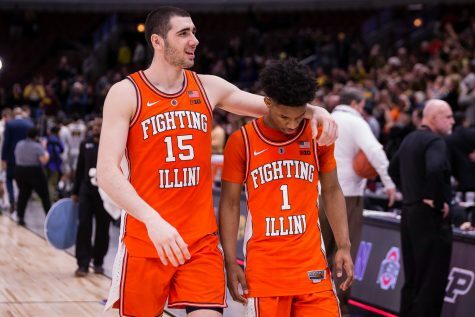 After Leron Black and Michael Finke graduated and transferred, respectfully, Illinois lost its leading and fourth-leading scorers, losing every minute from any player over six-foot-six inches. 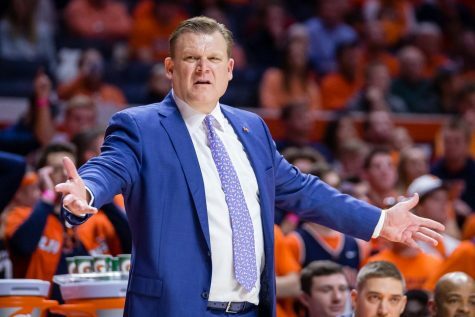 In the offseason, the Illini added three big men who look to get the lion’s share of front court minutes, but none of them have any Big Ten experience. 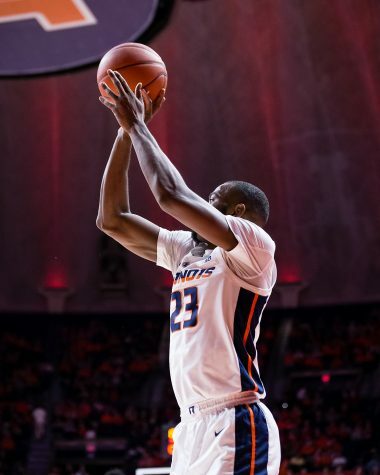 Grad transfer and seven-footer Adonis De La Rosa is still recovering from a torn ACL last year at Kent State but offers the Illini their most developed big man physically. There are reports he may be back in November for some nonconference games, but expect to see him by conference play at the latest. Underwood has praised his leadership and basketball knowledge this preseason, and few players can add more wins to this Illini team that struggled to rebound and protects the rim than De La Rosa. To start the year while De La Rosa continues to recover in the front court will be two freshmen, Giorgi Bezhanishvili and Samba Kane. 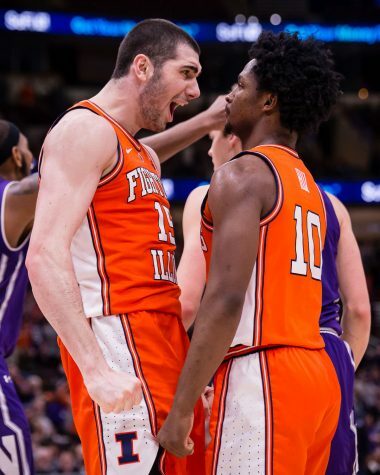 No player has made more of a name for himself than Bezhanishvili has this year; through his loud but likable demeanor and heavily accented joking, Bezhanishvili has already become a fan favorite for the Illini. Bezhanishvili provides Illinois with a front-court playmaker they haven’t had under Underwood, to go with a good lefty stroke from all over the floor. While he may not be the scorer Leron Black was or the shooter Michael Finke theoretically was, Bezhanishvili fits Underwood’s high-post and pinch-post centric offense better than both. For all the offensive talent Bezhanishvili has, it will be a while before he is a good defensive player and rebounder in the Big Ten. He doesn’t have top-end athleticism like Jones or length and size like Kane and De La Rosa, so at the beginning, it may be rough on the glass. When Bezhanishvili isn’t on the court, Kane will provide a different look for the Illini. The lanky seven-footer is obviously still trying to find his pace at the college level after missing the summer session of practices, but he has all the tools to be an effective center. Kane is long and decently mobile for someone his size; however, that comes at the cost of being one of the skinniest players on the roster, which is going to show most on the glass, where Kane struggled in practice. Offensively, Kane is still a work in progress. He plays hard, but often in the wrong spot, and struggles in practice to finish around the rim against shorter defenders. Kane was rumored to be better during Illinois’ “secret” scrimmage against Vanderbilt, so it may just be a practical problem. At best, Kane will be a disruptive defensive presence, but that won’t show until he becomes more comfortable with the system and where to be on both ends. Eventually, fellow freshman Anthony Higgs will join the mix in the front court after he rebounds from an offseason surgery earlier this year. At six-foot-eight, Higgs should give the Illini good size and athleticism off the bench, but anything substantial from him would be gravy. The new Illinois front court doesn’t have much time to get warmed up in-season, as the Illini will be playing high-major teams almost from the start of nonconference, with Georgetown coming to Champaign on November 13 followed by the Illini traveling to Maui, where they will face possibly the best team in the nation in Gonzaga. After all the offseason turmoil and the current state of Illinois revenue sports, there is a lot of unease about this team; however, Underwood feels like this team fits the way he wants to play more than last years, with better defensive players at almost every position to go with a plethora of new shooters and playmakers to space the floor around Frazier. 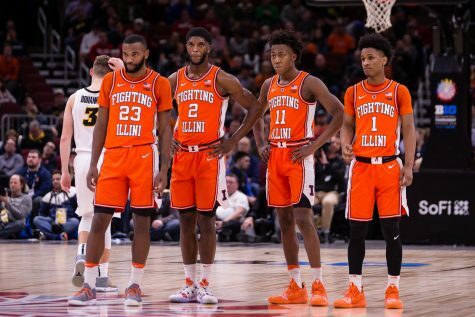 The Illini may not improve many record-wise due to one of the hardest non-conference schedules and a lack of reliable, known depth in the front and back courts, few teams will be more fun to watch on both ends than Illinois. Editor’s note: The story has been updated with additional content.